Scooting down the pistes with ease and ever stronger and surprising sensations, without any prior instruction, that’s what the Yooner is all about! Seated 20 cms from the ground, like on a snow go-kart, this new style of “skiing” is a real pleasure. It’s fun and easy to control your descent. The Yooner is light and easy to manoeuvre, equipped with a shock absorber for comfort, and a skate at the front allowing you to “carve curves” like in skiing. Try it, strong sensations are guaranteed! Take Yooner lessons: The Praz sur Arly ESF offer Yooner lessons, accessible to all. Where to rent a Yooner: The following sports shops have them: Emonet Sports, Derby Sports, Sport 2000 and Intersport. Hom much does a day’s rental cost? : Between 15 and 25 € for the rental of a Yooner and boots. Which ski lifts are accessible? : The Crêt du Midi and Rosière chairlifts accept Yooner users. Which pistes are accessible? : Combe Blanche, the Tendues, the Chars, Piste du Soir, Bérouds, Olvet, Bernards and Rosière. 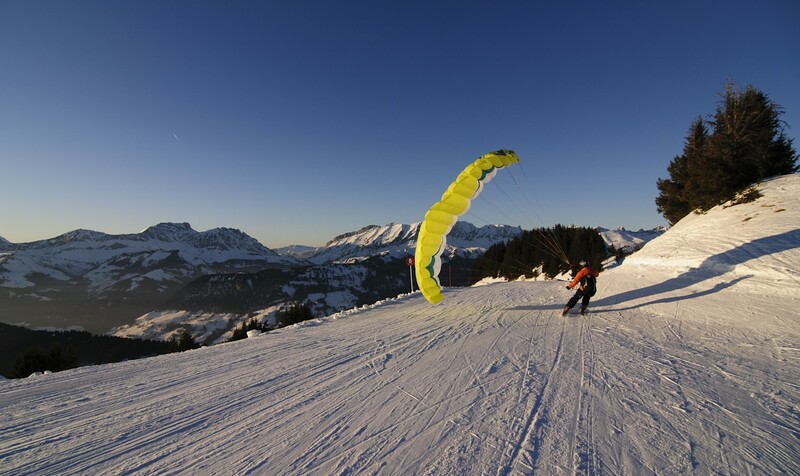 Discover this activity combining skiing and paragliding. It only takes half a day to learn the basics and experience new sensations of skiing and flying. Praz sur Arly is ideal for this activity as it has a special piste reserved for it, allowing you to try it out in complete security. After speed speed-riding last winter, Serge TUAZ has another fun activity to offer you. Wing-jumping is for children, teenagers and adults who want to discover new sensations on skis with a simple sail attached to your back. There is no question of flying, just discovering what the lift of the air can do to create some incredible skiing sensations.